I’ve been reading Genesis and Moses in the PGP. I came across this little quiz on one of the commentary sites I read every week. Oh boy, do I ever have a lot to learn! This is one of the stories (and there a lots of them) that we seem to learn from hearsay rather than personal study. This all from Ted Gibbons. Here’s the quiz. Hope you do better than I did! I took the test and got nearly half of them wrong. The quiz questions all come from Genesis and the actual account of the deluge. 4. Noah was in the ark for about 6 months. FALSE. The rains began in the second month of the six hundredth year, on the seventeenth day. (Genesis 7:11). It was the next year in the second month on the twenty-seventh day that God told Noah to leave the ark. (Genesis 8:14-16). They were in the ark for 375 days, plus one week before the rains began. 5. The ark was about the length of a football field. FALSE. The ark was 300 cubits. An Old Testament cubit is about 18 inches. Thus the ark was 450 feet long—about a football field and one half. 6. The ark had a door and a window. PROBABLY FALSE. That there was a door is beyond question. The animals and people must have and left entered the ark thereby. Genesis 6:16 speaks of the door, but also of a window. But the footnote for the word window in that verse tells us this: HEB. Tsohar; some rabbis believed it was a precious stone that shone in the dark. Sending out the dove and the raven (Genesis 8:7-12) suggests that the outside world was not readily visible. In fact. 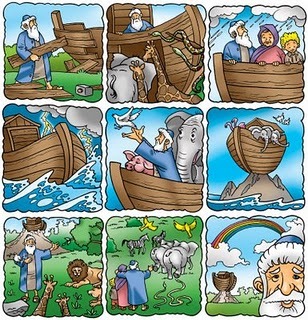 Noah could not see the outside until he “removed the covering of the ark, and looked . . .” (Genesis 8:13). The book of Ether suggests that the Jaredite barges were in some ways like the ark (see Ether 6:7). Perhaps it was from the records carried by the Jaredites that the brother of Jared got the idea for the shining stones used to light the windowless barges his people used to cross the ocean. There isreference in the Jaredite account to the absence of windows in the barges (see Ether 2:23). Why make them tight? You’ve seen the game Red Rover. One side links arms and then cries, “Red Rover! Red Rover! Send Danny (or someone else) right over!” Then Danny runs at full speed to the spot he thinks weakest in the linkage of arms and tris to break through. But if the other team is holding tightly enough, he will be held back and kept out. We must hold on to the word of God, to our prayers and scripture study and our covenants and our obedience, that tightly, tightly enough to repel every effort of Lucifer to break through and interrupt our joy. “And it came to pass that when they were buried in the deep there was no water that could hurt them, their vessels being tight like unto a dish, and also they were tight like unto the ark of Noah; therefore when they were encompassed about by many waters they did cry unto the Lord, and he did bring them forth again upon the top of the waters” (Ether 6:7).